CPR Training Courses in Vancouver, B.C. The largest provider of workplace, federal and provincially approved first aid and CPR courses in British Columbia is Vancouver First Aid. Established in 2008, this provider has 4 training centres located throughout the Lower Mainland. This provider also offers occupational first aid level 1 for participants that need certification to meet WorkSafe BC requirements. Other courses include standard and childcare first aid which teach participants to manage a variety of emergencies including stroke, heart attacks, choking, anaphylaxis, hypothermia, hyperventilation, diabetic emergencies, seizures, wound management, internal bleeding, broken bones and many more. Registration for a first aid or CPR training course in Vancouver or anywhere in the Lower Mainland can be completed using the information posted below. Enrolment to CPR instructional classes with Vancouver First Aid can be done on the Vancouver First Aid website here. An on-line registration form is available through the link. Trainees may also complete their enrolment through e-mail, telephone calls, or walk-ins during business hours in any of the training centres. This St Mark James provider is located along a main corridor in Vancouver with plenty of amenities, free parking, and great access to public transit. Check out the map below for more information about the main training facility. Trainees who are able to complete a training course are awarded a workplace or WorkSafe BC approved training certificate, valid for three years throughout Canada for whatever purpose it may serve the trainee. Some courses provide re-certifications such as standard and emergency first aid. Participants must have current awards in order to be eligible for re-certification. 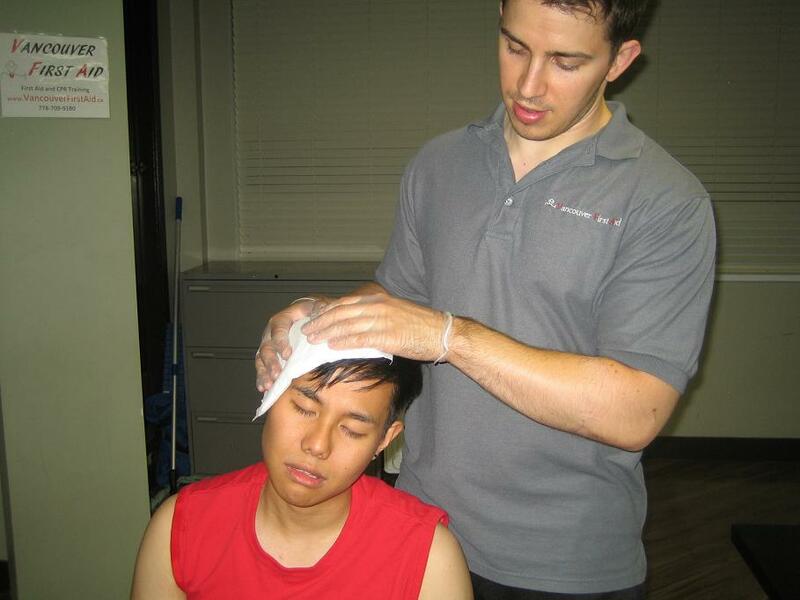 First Aid and CPR Training courses in Vancouver will teach students how to handle bleeding head injuries. Vancouver First Aid offers the cheapest course rates inside of the Vancouver local area. Rates include books, applicable taxes, and workplace approved accreditation costs. Training course costs vary between 25 dollars to 135 dollars, depending on the level of training course enrolled in. The following is the price list for all first aid, CPR and AED courses featured at Vancouver First Aid. Each of the above mentioned courses takes approximately 5 hours to complete. Re-certifications are available for level’s ‘C’ and ‘HCP’. 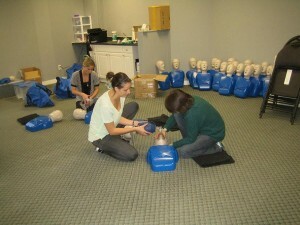 Vancouver First Aid observes the most recent tactics of first aid and CPR in its programs. Standards for first aid and CPR rescues are provided by the American Heart Association and the International Liaison Committee on Resuscitation (ILCOR). Participants will practice rescue techniques that follow the latest guidelines and updates. Stand-alone classes for CPR or first aid are also available if you don’t want to enrol in the full training course. Private classes are offered to big groups of trainees and companies as well. Performing the regular choking rescue can be difficult if you can’t wrap your arms around the victim’s waist. This is commonly seen in obese/middle-heavy and pregnant victims. Make a fist and place it at the highest part of the abdomen, just at the base of the breastbone. Cover your fist with your other hand. Make upward, inward thrusts until the object or food is dislodged from the airway. Learn more about how to handle choking emergencies by enrolling at Vancouver First Aid.